Omega has announced a new watch. 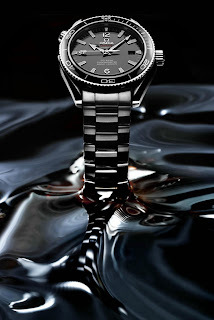 It is the Omega Seamaster Planet Ocean Liquidmetal Limited Edition watch. The watch will be a world first to bond ceramics and Liquidmetal. The bezel of the watch will be made of ceramics and Liquidmetal alloy. The bond will create a stunning silvery contrast of the numbers and scaling (of the bezel) against the black background of the ceramics. The watch will be issued in a limited run of 1,948 pieces, 1948 being the year the first Omega issued the popular Seamaster line of watches. Liquidmetal is a metallic glass alloy consisting of five elements. The five elements are zirconium, titanium, copper, nickel and beryllium. It provides seamless bonding and remarkable hardness, and these are the qualities that allows the numbers and scaling on the bezel to appear bold and vivid. 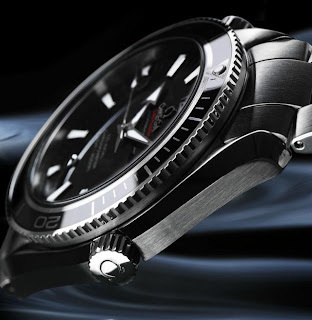 The watch will be powered by Omegas Co-Axial calibre 2500. The watch will have the following functions: hours, minutes, seconds and date.